A somber examination of why the war on terror has stretched over 15 years and appears to have no end in sight. Although Danner’s book does not focus on the current presidential campaign, it speaks to one candidate in particular. By stoking the public’s fear of terrorism, calling for a return to torture, stigmatizing all Muslims here and abroad, and calling for an unfocused, all-out war on the Islamic State, Donald Trump as president would violate America’s core values while feeding the growth of terrorism. Somebody should do him a favor and buy him a copy of this important and indispensible book. Spiral is a masterly writer’s case for the prosecution, a patriot’s indictment of his own country’s folly ... Danner neglects the other side of the ledger. America is less trapped in the folly of Bush-era policies than he maintains ... Danner’s indictment of these [Obama's] policies is unsparing, but it is sometimes less than clear what he would propose in their stead ... Danner is clearer about what America shouldn’t do than what it should. He shows, with eloquent conviction and considerable evidence, that torture, rendition, domestic surveillance, foreign wars, and democracy promotion at gunpoint have made America more enemies than friends. Ultimately a polemic, Spiral is at its strongest when taking on the Bush administration’s worst excesses: the unwarranted secrecy and boneheaded assumptions that led to disaster. Danner draws evidence from the rich histories of the era, deftly repurposing the words of former administration officials...Danner constructs a terrifyingly clear picture of the distorted logic of the Bush administration ... he largely overlooks the political realities Obama has faced, including a hostile Congress that has blocked any effort to close Guantanamo. He also pays too little attention to Obama’s attempts to end large military engagements. 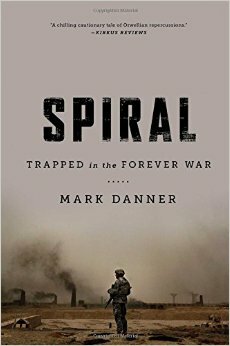 What did you think of Spiral: Trapped in the Forever War?